With your amazing intuition, you are able to create your own good luck. 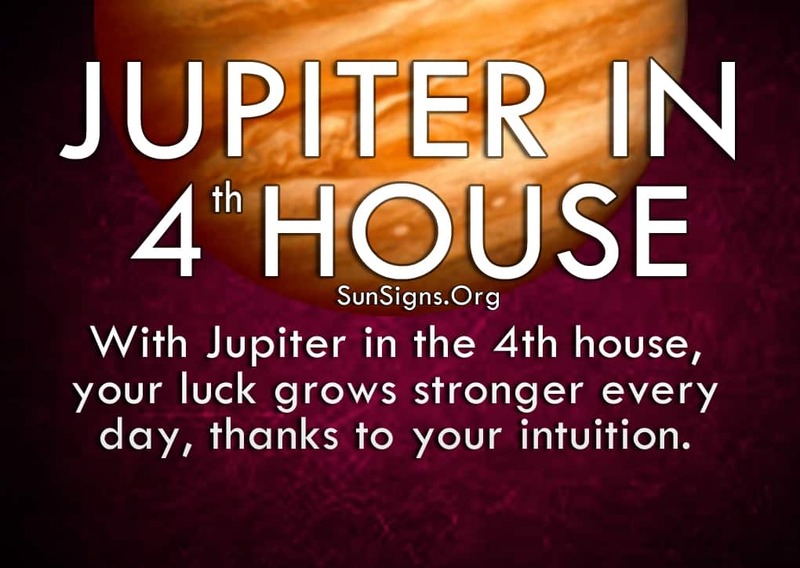 And with Jupiter in the 4th house, your luck grows stronger every day. You know what your loved ones need and you get a sense of fulfillment by helping them achieve their goals. Your relationships are strong. Family is very important to you, and you spend a lot of your time and good will on their happiness. Jupiter represents how we view our fortune in life, and you see yours through the eyes of your loved ones. (See planet Jupiter symbolism). You have a strong connection with your children and nothing can break that bond. But sometimes you tie too much of your self-worth into their livelihood, and if they are disappointed with something then you are also. Because you are a family person, you also want to build a comfortable home for you and your loved ones. The Jupiter in fourth house people work hard to maintain a cozy lifestyle. They are the ultimate hosts whenever someone visits. You have strong morals, and you are very protective of your friends and family. You will defend all of these things to the bitter end, and everyone loves you for that. And with Jupiter in the 4th house, you are guided by all of these aspects in your life to make the right decisions. The Jupiter in 4th house astrology predicts that you have to learn to do more things for yourself. Use your gut instinct to bring better luck into your own life. You can share in the wealth of happiness created throughout your entire social circle. Don’t be dependent on other people for your upbeat outlook on life. Figure out what makes you tick without anyone else’s help. This also means you tend to go behind the scenes and try to manipulate others into doing what you want. You don’t realize it, but you can get too caught up in changing your luck and everyone else’s luck. While you think you are doing this for the good of your loved ones, sometimes you are simply meddling in their lives so you don’t get hurt. You don’t deal with change very well, so you struggle to maintain the status quo no matter what the cost. But you have to learn that not everything can be contained the way you like it. So you have to be able to roll with the punches. Don’t use your concern as a reason to do whatever you want. Make sure it’s utilized in the right manner. Don’t worry if you lose your way once in a while, because there are many people there who are willing to help you out if you let them. The Jupiter in 4th house people have to remember that they don’t always have to be the strong on. Lean on their shoulders sometimes when you need to relax and unwind. You have a tendency to get so worked up over something that it affects your mental and emotional well-being. You need time to recharge just like everyone else, or else you are no good to anyone. Luck can turn on a dime, so make sure you are ready to handle whatever changes come your way.